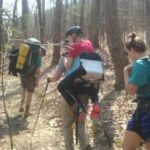 Many Appalachian Trail hikers decide to hike the trail under the influence of different circumstances. Some do it out of unhappiness with their job or relationship and others use the time as a way to find their inner self. Jacqui may have her own internal reasons for wanting to hike the trail, but her overall mission is clear; to push others beyond what they thought they could do. It is possible that some people see Jacqui’s vision as selfish in that she relies on other people to carry her from place to place. Those people do not know Jacqui. I spent four days on the trail with Jacqui. This may seem like hardly enough time to know someone in and out, but because of our circumstances it was easier than expected. She is the bravest person I’ve ever met. Each step of our journey was one step away from a fall that could have been dangerous for her. She was completely reliant upon us to carry her from one point to another, and she did this with grace and trust. Our group consisted of just five carriers. This included four Clemson University students (myself, Philip, Jimmy, and Lindsay). It also included a professor from our school by the name of Sean. We did not know each other by anything more than a few meetings prior to the trip. The number of carriers was not ideal. We carried all of our own gear and Jacqui’s gear in just four backpacks. A modified harness was used to carry Jacqui on our backs in ten minute intervals and we immediately carried one of the overstuffed backpacks whenever we weren’t carrying Jacqui. This meant no time off from large amounts of weight on our backs, something that most of us were not used to. 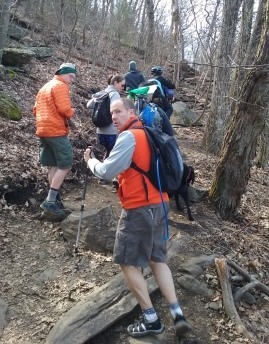 We also had another volunteer, Hopper, who carried some of Jacqui’s gear and served as our expert trail guide. She knows more about the trail and has hiked more miles than I could ever imagine. She was an amazing and interesting person to learn about. Personally, I knew one minute into my first ten minute carry that I was not ready for the physical challenges ahead of me. This may have been obvious to Jacqui, but she encouraged me the entire time. Her voice was soothing and helped to take focus away from the immense pain that my body was already enduring. We started at the beginning of the AT in Springer Mountain, GA. We “slackpacked” our first few miles up and back down Springer. This definitely made things a little easier. Once back down we readied our packs and made our way down the trail. The first day was not easy for me. Seeing the first campground was a relief, and I slept with ease. Day two started with some help. A hiker by the name of Smooth volunteered as our first carrier of the day. 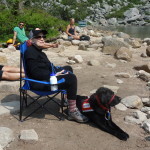 We had several volunteers along the way and we gladly accepted any help we could get. The second day was more difficult for me than the first. After a few miles of hiking we “yellow blazed” or hitchhiked a couple miles down the trail in order to keep our hike on schedule. Honey and Bear, two hostel owners from Maine and friends of Hopper, had come down to assist us with our hike. They met us every day at a road crossing with food and a potential ride when we needed it, and on this day we did need it. They took us to the next road crossing and we hiked backwards a long mile to the next shelter. I was either very tired at this point or unable to track distance because this “mile” seemed more like two or three. A storm was rolling in and we felt rain droplets and electricity in the air. We had heard that hailstorms were possible. We set up camp in a secluded area typically unused by hikers. One of the AT ridge runners had shown us this spot as a courtesy to give us enough space since the shelter was full. We set up camp hurriedly as the storm approached. Around 9pm, the other three students and I were huddled under a rainfly playing cards. The rain began to pour down and we soon looked out to see dime sized hail scattering the ground. Lightning and thunder crackled around us. The rain was coming sideways and soaking our hammocks. It was a wet night, but the exhaustion of the day had caught up to me, and despite my fear of lightning, I woke up refreshed at 6:30am, glad to have slept through most of the storm. By day three, my body was in pain from my shoulders to my toes. Most of us had begun to eat ibuprofen as if it were candy. I began doubting my ability to carry Jacqui, but as each 10 minute interval approached, I took my turn, as did everyone else. My leg muscles were on fire the entire day. I could feel muscles I’d never felt before. Even so, we kept going. Honey and Bear met us at a road crossing around lunch time. We ate and then had our first “foot check”. Not all of us had escaped without minor foot injuries. Mine included a split right middle toe, which was superglued on the spot, and an ominous blood blister on my right heel that would continue to grow. The foot pains had previously been masked by my leg pain, but now that I was aware of them it was much more difficult to ignore. Each step elicited sharp pains from my right foot. Luckily, Honey and Bear were there to help us yellow blaze past some of the more difficult mountains. After climbing another small mountain, we made our way comfortably into camp that evening. Most of us woke up the next morning with the relief of knowing that we were halfway done with our week long hike. We didn’t know that this would be our last day on the trail, nor did we ask for it to be. We hiked a few miles that chilly morning. Along the way we took some photos at a few scenic spots atop a mountain. Our last mile or two was coming down a mountain with many switchbacks. An older man in front of us with a different group had fallen while experiencing vertigo. He was slowly being helped down. It was the only time that our group passed anyone on the trail. Typically, we were much slower than solo hikers or other groups. Because of the steepness and narrowness of this descent, our 10 minute carries often exceeded 13 to 15 minutes until we could find flat ground to switch carriers. Two or three minutes extra was much more difficult than one would expect. My legs were shaking by time we were halfway down. I was fearful that if I put too much weight on either one of my legs that it would give out under the pressure. Still, we made it down. Honey and Bear met us once more. I ate what they had to offer and sat on the ground, totally exhausted. Sean, Jacqui, and Hopper discussed what to do next. Clearly, most of us were in pain, and fear of further injury was apparent. Our water was low and the next source was too far away. We reluctantly decided to end our hike here. This was associated with some relief as well. Personally, I was not sure how much further my body would go. I had gone beyond my limits on the first day, and by day four it had more than caught up with me. On reflection of our trip, I have decided to term it a successful failure, in that we did not hike the distance or days that we had hoped but that we had done more than many people thought we were capable of doing. I lean heavily toward the “success” half of that term. I am proud of what we accomplished. We persevered through each day despite our pain, and beyond that pain we found friendship and commonality among ourselves, despite age differences, background, or ability. I found that my personal limits were only defined by my own self-doubt, and I have peace knowing that I’ve overcome it. Thank you, Jacqui, for letting me carry you. I hope that many others will come along to do the same.